Ella Woodward shares her simple pancake recipe using her Deliciously Ella Bircher Muesli from her new range of plant-based products exclusive to SuperValu. 1. Mix all of the pancake ingredients together to form a smooth batter. 2. Now make the pancakes. Warm 1 tablespoon of coconut oil in a pan over a medium heat. Once the pan is hot and the oil has melted, spoon in a large tablespoon of pancake batter, using a wooden spoon to spread it out. 3. Cook on one side for 4 minutes before turning and cooking the other side for 2 to 3 minutes, until cooked through. Remove and repeat until all of the batter has been used up..
4. 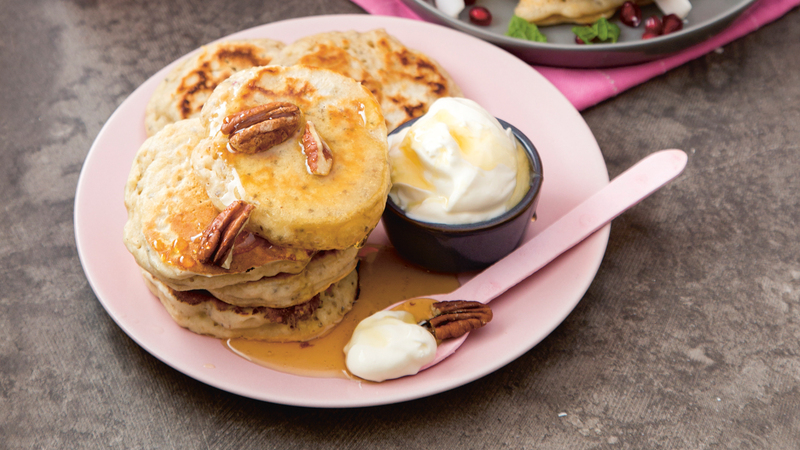 Serve the pancakes warm with a dollop of coconut yogurt and a few pecan halves scattered over. Ella uses gluten-free flour but you can also use a self-raising flour to make the pancakes extra fluffy.